Army Lt. Gen. Robert P. Ashley, director of the Defense Intelligence Agency, said during a Senate hearing the character of war is changing as technology facilitates greater global reach with weapons such as cyber attacks. War is no longer carried out as it was during Europe's 30 Years' War when forces lined up for battles, he said. "So the line of which you declare hostilities is extremely blurred, and if you were to ask Russia and China, ‘Do you think you're at some form of conflict with the U.S.?' I think behind closed doors their answer would be yes," Ashley said. The three-star general was commenting when asked what would constitute an act of war, such as a cyber attack or use of space weapons against satellites. "It's hard to make that determination to definitively say what constitutes an act of war when you're in the gray zone in a lot of the areas that you operate," Ashley said. Director of National Intelligence Dan Coats, appearing before the Senate Armed Services Committee with Ashley, also voiced concerns about the growing threat posed by China's military buildup and global influence operations. "I think it's been very clear over the past few years that China is willing to take pretty extraordinary means in terms of expanding its influence, not only over the region in South China Sea, but throughout the globe," Coats said. In a 35-page prepared statement, Ashley provided new details of a growing list of military and information threats to the United States posed by China, Russia, Iran, North Korea, and terrorist groups. The threat posed by China dominated much of his testimony, however. According to Ashley, the ruling Communist Party of China has streamlined and upgraded both China's huge military forces and its command structure. The result is China is preparing for operations he described as fighting "short-duration, high-intensity regional conflicts at greater distances from the Chinese mainland." The military buildup has produced improvements to warfighting capabilities for all domains of conflict, including air, sea, space, electronic warfare, and information operations, he said. A key worry is China's advanced long-range land attack and anti-ship cruise missiles that can be fired from ground launchers, aircraft, ships, and submarines, he said. Ashley also disclosed for the first time that China is augmenting its land- and sea-based missile capabilities with two new air-launched ballistic missiles, including one that will be nuclear-armed. China's nuclear forces also include ultra-high speed hypersonic strike vehicles launched from missiles and silo- and rail-based long-range missiles. Nuclear missile submarines and bombers also pose a threat to the United States, Ashley said. Additionally, China has space weapons capable of shooting out satellites during the early stage of a conflict, including anti-satellite missiles, maneuvering satellites and lasers and electronic jammers. The space weapons are aimed at crippling military communications, navigation, and weapons targeting. Ashley said the Chinese military buildup is being carried out in concert with a global economic, commercial, and infrastructure development program Beijing calls the Belt and Road Initiative. Coats, the DNI, said the global infrastructure program is costing Beijing about $8 trillion in 68 nations, and that the program will be used for "geostrategic positioning" for trade, economic, and military purposes. "They definitely are expanding their regional influence, as well as their global influence," Coats said. "They're spending an extraordinary amount of money on that as well as on upgrading their military, and it's become a world power and that is their goal." Ashley said China's nuclear program also is expanding along with other advanced weapons. "A modern, effective nuclear deterrent and substantial investment in advanced cyber, electronic warfare, and space capabilities will bolster China’s ability to fight and win modern military engagement across multiple military domains," the general said. On Russia, Ashley warned that Moscow is also building up nuclear forces and other high-technology strategic weapons, such as hypersonic, cruise and ballistic missiles. "Russia views the United States as the primary threat to its national security and its geopolitical ambitions," he said. "The Kremlin seeks to establish a sphere of influence over former Soviet Union states, prevent further eastward expansion of NATO, and ensure that no major international issues are addressed without Russia's input or at its expense." Russia's information operations against the United States, including meddling in the 2016 presidential election, was a topic of the hearing. "There obviously is concern about this ongoing effort of Russians to interfere with our elections," Coats said. "The White House is well aware of that, as we all are, and agencies have been tasked to address this." Ashley said artificial intelligence combined with the weaponization of Big Data—mass amounts of data that can be used for strategic purposes—is an emerging threat as well as a U.S. tool. "So, as we start seeing what's changing hourly in the character of war, you have speed of decision," he said. "So there's all these disparate things that are happening globally, all the information that's moving around. For us, from the intelligence standpoint on military side, it's being able to see the indications or warning, being able to see the faint signals of conflict that may be coming your way. And so, to take all that disaggregated information, and aggregate it in a way where you can start to see trends, indications, and warnings, and it gives the analyst time to start to think about what he or she is seeing." He called efforts to utilize Big Data for military purposes "a critical capability that we're focused on." Coats was asked about China's use of soft power, like the Beijing-funded Confucius Institutes that are spread out around the United States and the world to influence colleges in support of Chinese policies. 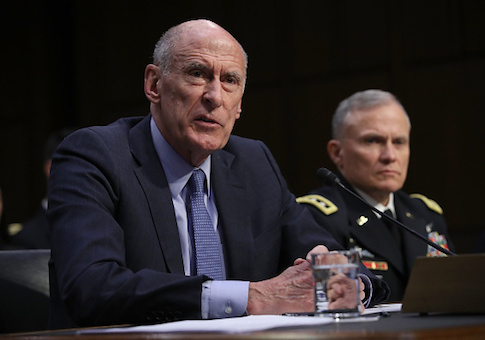 "There has been significant interest in this," Coats said when asked if Chinese students in the United States are being used as Beijing spies. "We take that very seriously in assessing where China is and where's China going." "In fact, we have some investigations going on relative to what China is doing and what their real intent is and how much of it is linked to the Chinese government policies, rather than just students wanting to come to get a good education here," Coats said. Coats said he doubts China would agree to allow reciprocal U.S.-funded Alexander Hamilton Institutes in China in exchange for permitting Confucius Institutes in this country.